Kenninghall Chimney Mill was so called because of an adjacent chimney built by William Lock in the 1850s. It is not clear if the chimney was on the Mill house or an outbuilding. 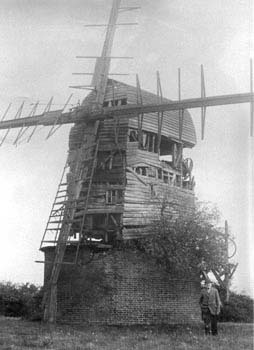 The mill stood to the west of the Lopham Road to the south of the village on Kenninghall Heath. The mill buck was set on a two storey roundhouse, the ladder held a 6 bladed fan and there was a curved porch at the top of the stairs. Two pairs of underdriven French burr stones and a flour mill were driven by 2 pairs of patent double shuttered sails struck by rack & pinion, the outer pair having 8 bays of 3 shutters and the inner pair having 7 bays of 3 shutters and 1 bay of 2 shutters. The photo at the top of the page shows Herbert Benjamin Bush standing beside the mill shortly before he died and not long after the photo was taken, the mill caught fire. Herbert Bush worked the mill for 46 years. Great spur wheel 3 ft. 6 ins. diam. 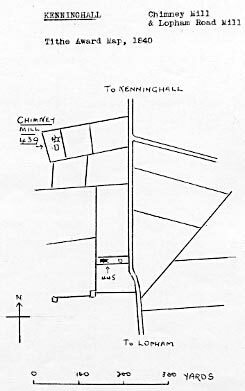 AN ESTATE in Kenninghall in the county Norfolk, in the Occupation of Mr. John Licence & his Tenants, consisting of two Messuages, Granaries, a good Windmill & about half an Acre of Land being part Freehold & part Copyhold. This Lot is Freehold & well situated for Trade. Applications to Messrs. Wallace & Lyus, Solrs. Diss, Mr. Thomas Davey, Garboldisham or Mr. Newson, Bury St. Edmunds. WANTED, an IMPROVER to work a Windmill. Apply to G. Chamberlain, Kenninghall, Norfolk. Arthur George Fordham took 6 feet off the sails, which had previously almost touched the ground. Herbert Bush once worked the mill non stop for a fortnight. Site at Townlands_Farm. 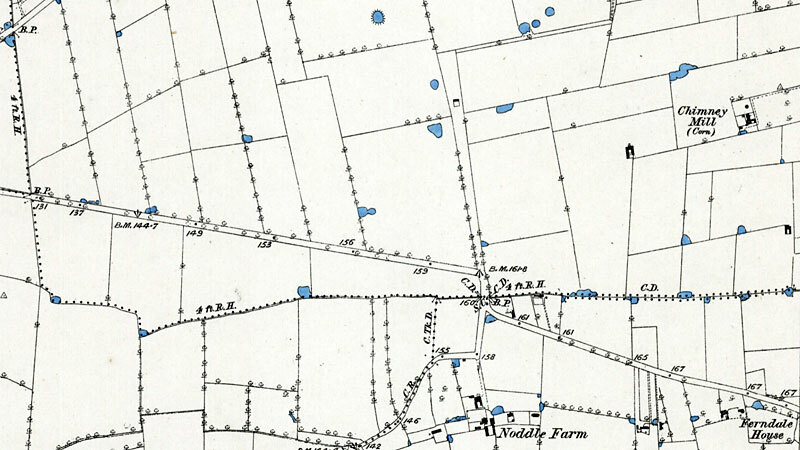 His father, Bertram Gillings used to farm there as tenant of Trustees of Kenninghall Townlands Charities, the owners.